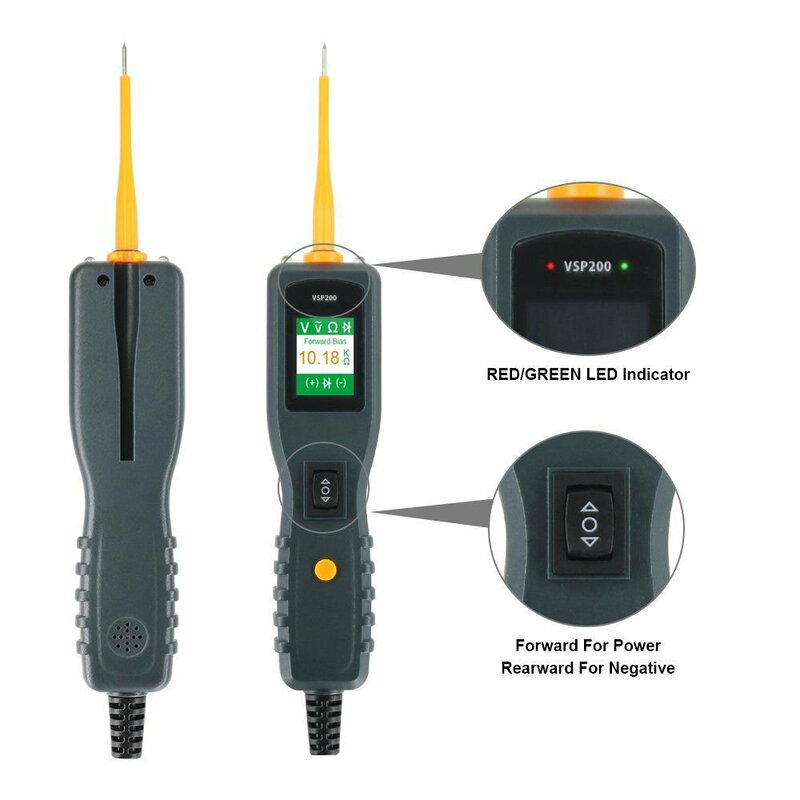 【Circuit Tester with Wide functions】Voltage & Polarity Testing, Continuity Testing, Signal Circuit Testing , Activating Components in hand as well as in the vehicle. And Testing Trailer Lights and Connections, Activating Components W/Ground, Red/Green Polarity LED, Following & Locating Short Circuits, Checking for Bad Ground Contacts. 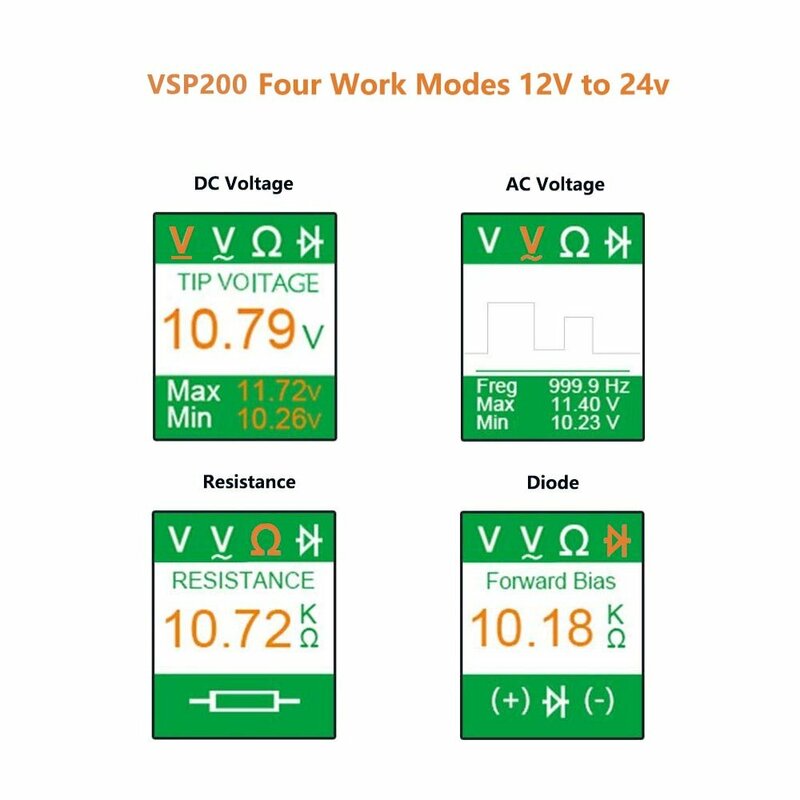 【Four diagnostic modes for 12v-24v】DC Voltage, AC Voltage, Resistance and Diode. Also test the continuity of the power switch, relay and diode quickly. 【Safety Protection design】Automatic 8 Amp Resetting Circuit Breaker protects the tool from overload. Getting Power Source via Connecting with vehicle battery and Cigarette Lighter. Prepare to leave your other circuit tester tools on the bench. 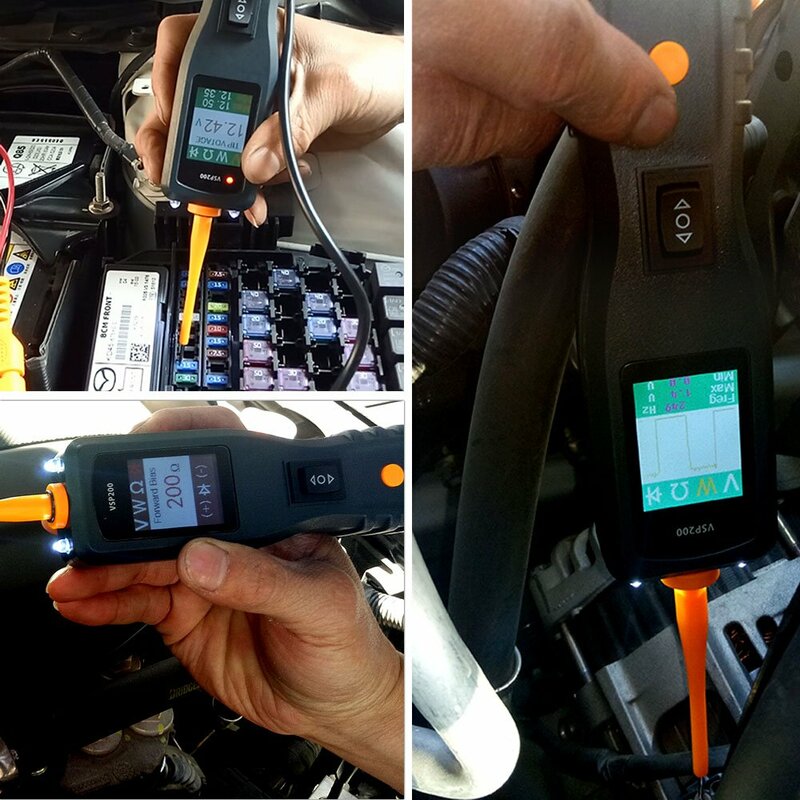 Once you connect the VXDAS VSP200 to your car battery you will have access to an amazing variety of diagnostic functions. With the press of a switch you’ll have an instant hot lead or ground lead. 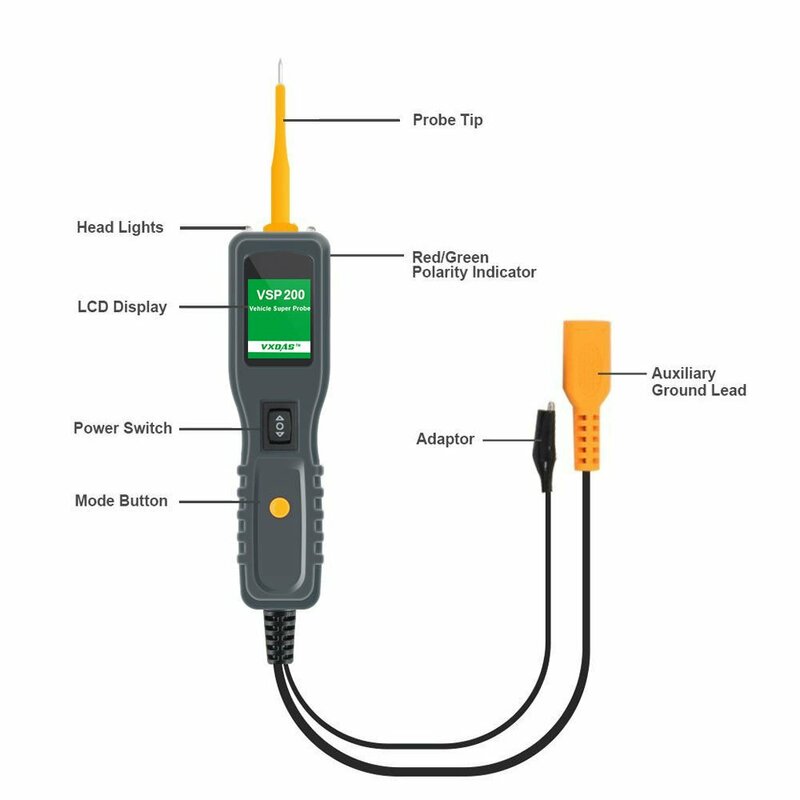 Use the probe tip and ground lead simultaneously to power up components right in your hand. 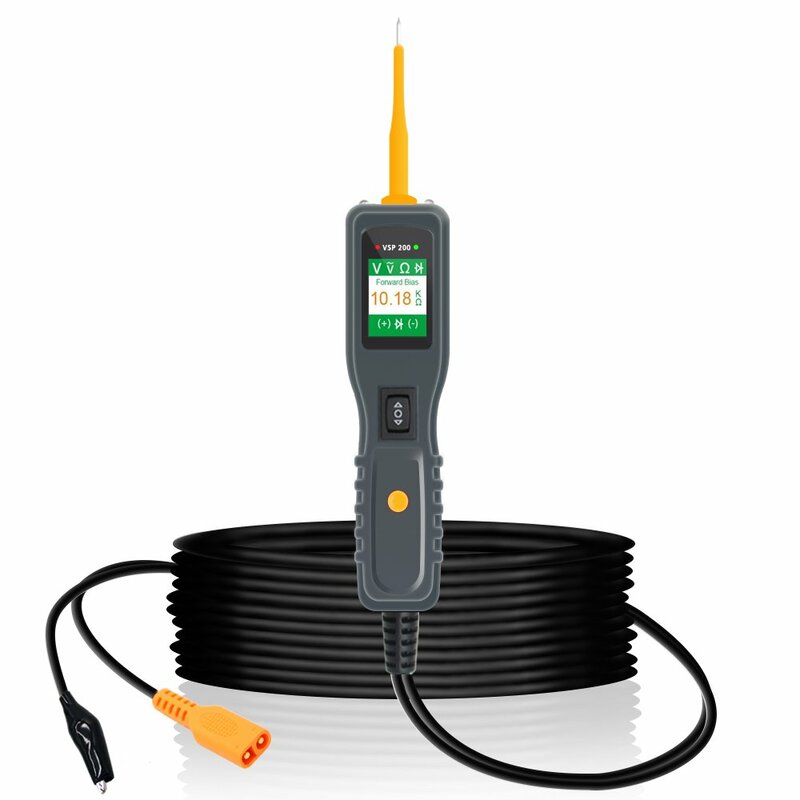 Instantly check components for continuity as well as identify positive, negative and open circuits without re-polarizing hook-up clips. Locate shorts without wasting fuses. 【Read Results on LCD Screen】A LCD Screen can display all the test results and two head light help you know the results clearly in any light and work in the dark area. 20 feet long cable allows you to conveniently use the tester to detect any area of the car. 【Support multiple vehicles and After-sales warranty】For cars, boats, trailers, ATV, motorhomes and many other vehicles. Packaged with a case to avoid loss and damage. Custmer service, any problem, just contact us freely! My husband needs this, he gets thrown across the room every time he does electrical stuff, but refuses to admit he is tempting fate. Will make a great birthday present for him.